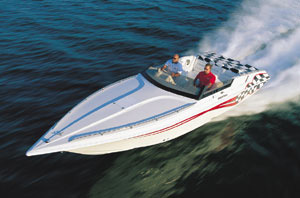 Sportboat builder going after speed mark for the V-bottom kilo record. 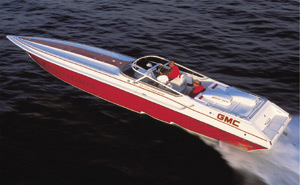 Despite increased production of its performance-oriented center consoles and go-fast V-bottoms, as well as having several new models on the way this year, the buzz—at least in the high-performance boating community—surrounding Fountain Powerboats in Washington, N.C., has little to do with the resurgence of the once-legendary brand. Instead, the focus is on the company’s planned assault, lead by no other than Reggie Fountain, Jr., himself, on the V-bottom kilometer speed record. Fountain will use this purpose-built 40-foot V-bottom in its attack on the V-bottom kilo record. Outerlimits Offshore Powerboats currently holds the Unlimited V-bottom-class record with a mark of 180.464 MPH set in 2014 set by driver Brian Forehand running a canopied 43-foot V-bottom with turbocharged 1,650-plus-HP Mercury Racing engines in 2014. 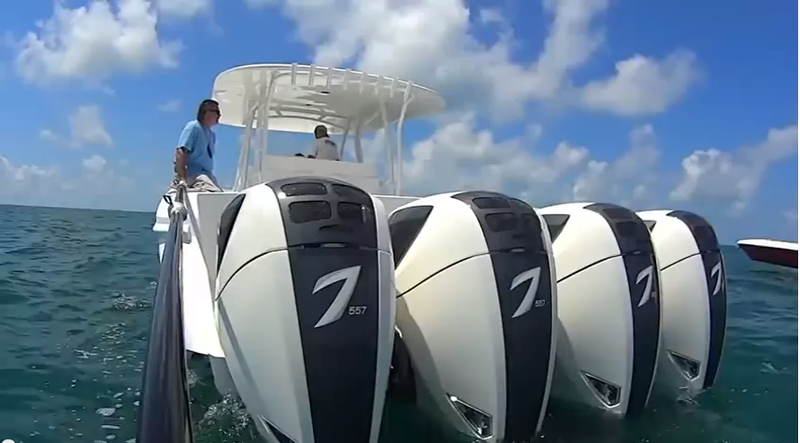 Fountain wants to break it with driver Benny Robertson, Jr., running a new canopied 40-foot V-bottom powered by 1,900 HP turbocharged Sterling Performance engines. A kilometer record is quite simply the average speed of a boat during two timed passes—one in each direction—on a measured kilometer. Raising the bar from a Fountain-held 171.888 MPH, Outerlimits set the mark during two days of attempts on the Pamlico River behind the Fountain plant. The Fountain kilo boat will try to set a new mark on the same waterway. While a firm date for the attempt has not be released, the Fountain team would like to go for it by the end of February. The American Power Boat Association, which is the domestic arm of the Union Internationale Motonautique (powerboat racing’s international sanctioning body), will record and sanction Fountain’s kilo record attempts. 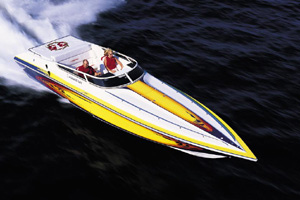 An APBA regional division organization, the Offshore Powerboat Association will be the host club for the event. Like the Outerlimits event, the Fountain kilo attempt is a Special Event sanction under APBA, meaning only the 40-foot Fountain will be allowed to compete (set in 2004, Fountain’s 170-plus-MPH kilo record was an open-to-all comers events). Water and weather conditions need to be perfect, which means having an alternate day or two in the plan. Reggie Fountain, Jr. (left) consulted with industry experts such as Billy Moore (center) on the project. Ben Robertson, Jr., (right) will pilot the boat. In guiding the project, Fountain, Jr., reached out to a team of experts including Mike D’Anniballe of Sterling Performance, famed catamaran builder Peter Hledin of Skater Powerboats and offshore racer Billy Moore, the son of renowned engine builder Bobby Moore. 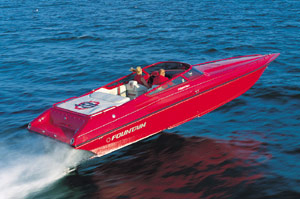 His son, Reggie Fountain, III., also been closely involved in the build of the 40-footer. But the driving force behind the project is Fred Ross, the owner of Iconic Marine Group, which owns Fountain, Baja and Donzi brands. By all accounts, Ross is a longtime fan of Reggie Fountain, Jr. The point of the effort is, of course, is marketing raising public awareness for the Fountain brand. 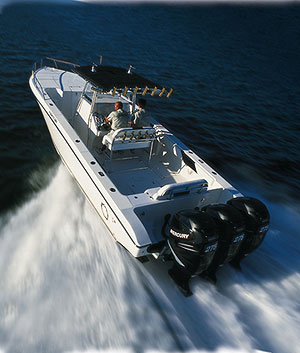 Despite that the company’s primary push at present is in the center console segment, Fountain’s leadership plans to rebuild its high-performance sportboat presence. Bringing back the kilo record to Fountain could help. At the very least, it will get people talking. Once the boat’s Sterling Performance engines arrive, the Fountain team will install and rig them, and then begin testing. In fact, it already has. Social media, as well as the message boards of various online communities, are buzzing about it.Still, even with the best preparations and all precautions taken, a kilo record is a dangerous pursuit. Everyone involved realizes that. “It will be good for the brand,” said Joe Curran, Fountain’s chief operating officer. “But the most important thing is safety."